Kids toys. Where do I start? Its like they multiply overnight. And then Christmas and birthdays come along and I go into over load. I have a whole room just dedicated to kids toys. I try and keep toys out of the girls rooms. So today I was in my favorite $2 shop and I saw these wonderful buckets. 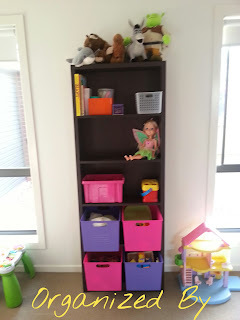 I have been after some buckets for the book shelf in the playroom for a while. Nothing I looked at was high enough or the width was wrong and I could not get two side by side. Finally I saw these! I was thrilled. They came in pretty colours too. So I got pink and purple for the girls. Eventually I want to get a different shelf but this one does the job at the moment. When I got home I emptied the shelf. I sorted through everything that was there. 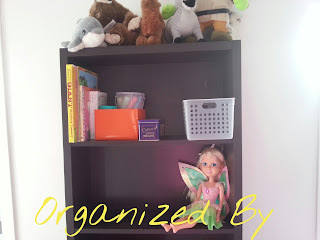 It had sort of been used as a dumping ground for everything as there was no organization at all. Once that was done I decided on the contents of each bucket. 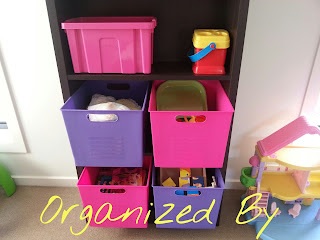 There is other buckets used in the room so there is other storage. So I thought on the bottom shelf I would put books and puzzles. 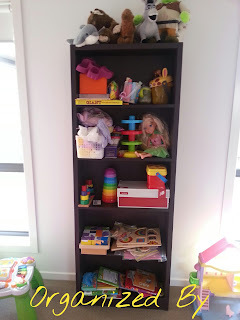 Then on the next shelf dolls clothes and the tea set and play food. I only got the four buckets because if I made it to high it would make the shelf very top heavy. Also I would be hard for the girls to use them. On the next shelf up is blocks and cups. On the 4th shelf is free except for one doll. YAY! Space for when the next influx of toys happens. Or I might actually make it an arts and crafts shelf. And the top shelf is chalk for the black board, play dough, paints and books that I don't want my 1 year old to destroy. And spare space. On top of the book shelf is special toys. Not for every day play. So I'm thrilled that I have space left over. So it will make it so much easier to add things along the way. I haven't labeled anything yet as my one year old will just pull it off and either use it as a skid plate or chew toy. But eventually I will make up labels. Im thinking of doing pictures. It makes it so much easier for children that can't read yet. So what do you do to control the toy explosion?